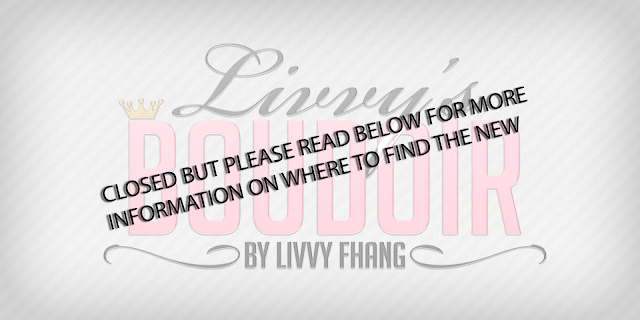 Livvys Boudoir: Is this Good Bye? Not really but keep reading!! This is one of the hardest things, and yet one of the most exciting things I have ever had to write. I am moving the blog to a new location. This blog was started on December 24th 2011. Livvy's Boudoir has been a major part of my Second Life for so long its rather hard to say good bye. But there comes a time when you have to move forward in life and go on to bigger things. This has been a choice that has been weighing on me for so long. There are several reasons I wanted to move my blog. I wanted my own domain under better control to grow the blogs look and feel and to have a little more control. Plus, I am very happy right now in my life with my new love life restarted. While Caleb was very understanding and would have happily blogged on here with me, but it didn't feel right. Don't get me wrong I would have been more than happy to share, but deep inside it was not the right fit for us. So we came up with a new blog, one that would represent us both, one that wasn't attached to just my name. So for me this is a semi fresh new start, as I had to move all my posts from this year to the new blog, incorporate Caleb, trans my feeds over, and all the other little information. But now if you check us out, you will definitely get the vibe of two people. The title of our blog is a special meaning for us so this is the new leap forward. I am not shutting this blog down totally, it will still be here, but for now my posts will be on the new blog. I would love to have my current readers to come see our new page, and follow if you wish! The flickr will remain the same. And if you do come over to the new blog, check out Caleb's work, he is slow at blogging, but when he does ... its amazing. He is so good at spinning the words and making you want all the things. Caleb will be one hell of a good male blogger when he gets his feets going. So for now this is me signing off on this blog, and moving to the newer blog. This is an exciting new journey for me. And now I can say us ... because Caleb is coming with me.